Scale Models Wellington is delighted once again to be hosting Scale Models Expo in 2018! The 2018 Scale Models Expo is for everyone to enjoy, with scale model displays, competitions, trade stalls, local and international special guests, demonstrations, and most importantly fun activities for families! You’ll see hundreds of amazing creations from the tiny to the massive, including models of historic aircraft, robot warriors, ANZAC legends, iconic starfighters, armoured vehicles, space marines, classic cars and many more. The Expo public competition is a always big event in the New Zealand scale modelling calendar and it’s open for everyone to enter. Both kids and adults can bring their best work and compete for honour, glory and some terrific prizes included special awards from Wingnut Wings for the best ANZAC subjects in the show. Whether you’re a competitor or not, come along and inspect the entries up close to see just how much hard work and skill goes into creating these miniature works of art. The Expo will be held over the weekend of 21-22 April 2018, in the Expressions Arts & Entertainment Centre at 836 Fergusson Drive, Upper Hutt, Wellington. Ticket sales are on the door only, we are able to take payments by cash or EFTPOS. Tickets are for one day, but you can re-enter as often as you like during the day. If you enter one (or more!) models in the competition, you will receive a free entry pass for both days. You can download and print these posters. They should print without scaling on most printers. Please read the following for detailed information about the Expo public competition and IPMS (NZ) Nationals. The Expo is supported by a great group of traders from the Wellington area, NZ and overseas. 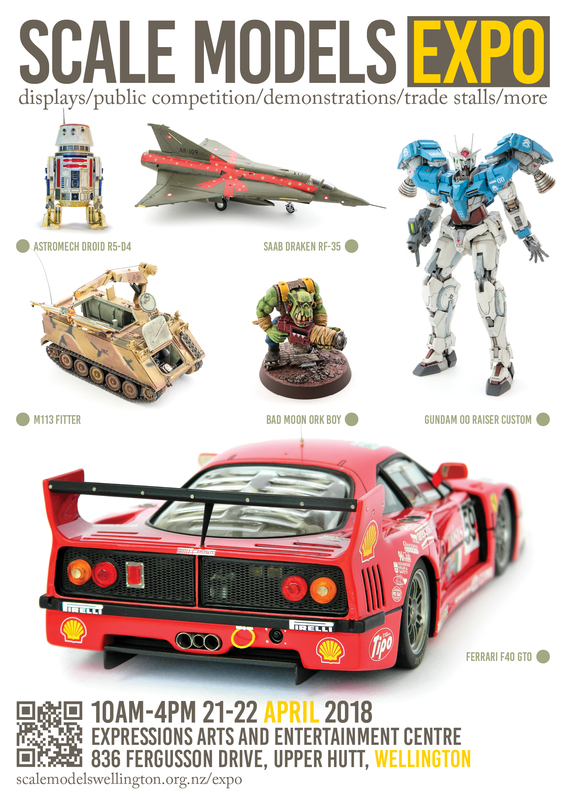 It’s a fantastic chance to see the latest model kits and hopefully grab a bargain or two. We’d also like to thank our sponsors for their help in making the Expo a success. We encourage traders in scale models and related materials such as tools, supplies and reference material to consider hiring table space at Expo 2018. More details including terms and conditions are in the following document.